June 2011: After spending his entire career in politics as “Jon Huntsman Jr.” the candidate drops the suffix in preparation for his presidential bid. A late-life Oedipal revolt? No, just a convenient way to distance himself from his billionaire father Jon Huntsman Sr., a man who regularly shows up in Forbes’ lists of the world’s richest people. June 15: To promote awareness of their impending official announcement, the Huntsman campaign begins releasing a series of Fred Davis-produced 30 second web ads featuring a Huntsman stand-in riding the candidate's motorcycle through Monument Valley. Foreshadowing the unorthodox campaign strategy to come, each spot offers a bit of oblique character praise. One example: "Did not become famous with his band ‘Wizard.’"
June 21: In honor of Reagan, who also launched his candidacy there, Huntsman officially announces his campaign for the presidency at Liberty State Park in New York. Members of the media are issued press passes promoting “John Huntsman for President,” much to Jon Huntsman’s chagrin. July 21: Susie Wiles steps down as campaign manager while Huntsman opts to retain divisive chief strategist John Weaver. Two weeks later, a Politico exposé describes the Huntsman campaign as “disorganized and full of staff tension,” painting Weaver as uncooperative and prone to conflict. August 31: Huntsman releases a tax plan that in any other year would be maligned as radically conservative, but in the current campaign cycle hardly raises eyebrows. Among its policy aims are to dispense with the Alternative Minimum Tax, as well as taxes on capital gains and dividends, and to reduce the corporate rate from 35% to 25%. September 1: Huntsman replaces New Hampshire campaign manager Ethan Elion with Sarah Crawford Stewart, a campaign veteran who ran the New Hampshire activities of Tim Pawlenty's brief 2012 presidential bid. The move signals the campaign’s intention to go “all in” for the Granite State primary, as it begins redirecting staff there from other states. September 16: Former governor of Pennsylvania and first Secretary of Homeland Security Tom Ridge officially endorses Huntsman, earning indifferent shrugs across the country. December 5: Donald Trump appears on Hannity to brag about snubbing Huntsman and Ron Paul. “[Huntsman] wanted a meeting. I didn’t give it to him… And then I see him in a debate saying, ‘unlike you people, I didn’t go and see Donald Trump.’ He’s a Mormon, so I’m sure he wouldn’t lie about it.” Huntsman complains that Trump’s input “dumbs down and makes less consequential” the pertinent issues. Later that day, Huntsman is disinvited from an upcoming debate in Iowa because his latest poll numbers are too low. December 7: Huntsman ditches his “sane moderate” image, labeling himself a “consistent conservative,” and challenging the conservative credentials of Mitt Romney and Newt Gingrich. January 6, 2012: Huntsman earns the endorsement of The Boston Globe whose approval is coveted because of its influence in New Hampshire. 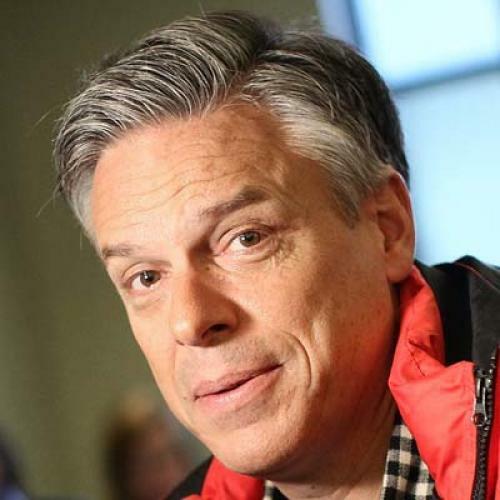 January 10: Jon Huntsman receives 17 percent in the New Hampshire primary, losing to Mitt Romney by more than 20 points. Huntsman promises to fight on, but with little organization in the coming primary states, and even less momentum, his bid for the White House seems all but over. Simon Meiners is an intern at The New Republic.